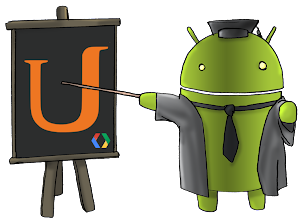 Google has announced Android development training, at no cost. Really ought to be a no-brainer: the entire curriculum is provided. If tutoring is appropriate, there is a small charge. The social and technological impact of the Open Source movement for innovation has been staggering. Interestingly, though, several prominent projects are losing their non-profit status. Ruth McCambridge of The NonProfit Quarterly notes that history is repeating itself, and that many journalistic endeavors had been struggling to maintain their non-profit status. Digital Media Law has an excellent reference summary for ensuring that the journalistic inclined are efficiently packaged for IRS consideration. These materials should be easily applicable to many Open Source initiatives. Or, on the other hand, the Open Source community could take the example of the NFL, a 9.5 billion dollar a year enterprise which is a legally recognized non-profit. The benefits for playoffs from Drupal against Wordpress, or Linux versus BSD would be certainly raise the entertainment value of the Open Source community. Who's the Prettiest Language of them All ? The venerable and esteemed IEEE Spectrum has an interactive chart for ranking computing languages. The references that they use are Google searches/trends, Twitter, GitHub, Stack Overflow, Reddit, etc. These comparison charts are always valuable, but they also introduce new questions. 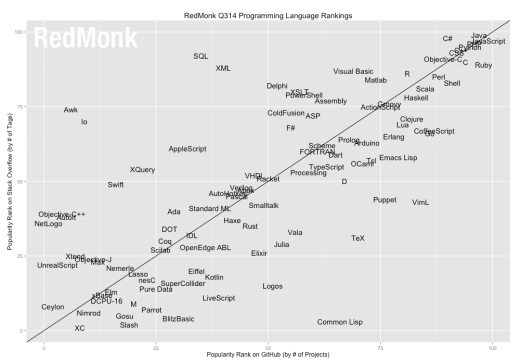 For instance, why does the IEEE data differ so much from RedMonk's own listing of programming languages ? Sure, the reference sources are a bit different, but Objective-C or Shell scripts have dramatically dissimilar rankings between the two summaries. Redmonk only pulls data from GitHub and Stack Overflow, so it's now apparent that their programming choices are not universally applicable. Java is still king, and because of it's universal utility, it'll be in the #1 slot for the foreseeable future. Python, though, is clearly benefiting from the cloud--it's the Swiss Army Knife of infrastructure APIs. Kenneth Corbin, writes in CIO that Amazon is continuing to develop its core services for the public sector. To date, AWS has won contracts with more than 800 government agencies, more than 3,000 educational institutions, and more than 10,000 nonprofit organizations. It's the first time the company has broken out a customer count in the nonprofit sector. Teresa Carlson, vice president of the worldwide public sector with AWS, points to a constellation of factors, from government mandates to cost pressures and broader acceptance of the cloud model, indicating that the public sector can no longer be a sidelight to Amazon's enterprise cloud business. But catering to government and other tightly regulated sectors puts a premium on issues such as security and compliance, Carlson points out, noting the work Amazon has done to win certifications such as FedRAMP and the various levels of authorization to operate, or ATO, within the defense community. OpenStack continues to spark a lot of interest as a completely opensource IaaS, which is competing against AWS, Google's Compute Engine, and Microsoft's Azure. Right now, its growth seems to be strongest as a private cloud. That means, it's even more critical to have the design implementation correct, and to include O&M within its true operational cost. OpenSource.com has provided a useful compilation of management interfaces for OpenStack. 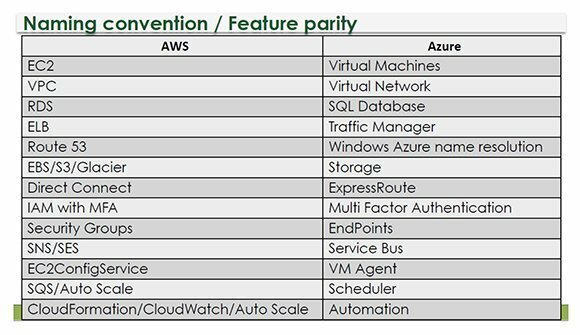 Not quite as entertaining as Mad Magazine's Spy-vs-Spy, Bridget Botelho has summarized a useful comparison in the terminology and services that are offered by AWS and Azure.